Found myself pottering past the Bank of England Museum on Friday afternoon and popped in. I thoroughly approve of this museum, mainly because it’s a niche interest museum, and depth in museums is often better than breadth. Because of this nerdy specialism, they sell proper faux leather Bank of England commemorative bookmarks in the shop. Bookmarks are getting harder to buy in museum and exhibition shops, but generally their appearance indicates intelligent thought has gone into the museum. Museums that sell bookmarks are always better than ones which don’t. 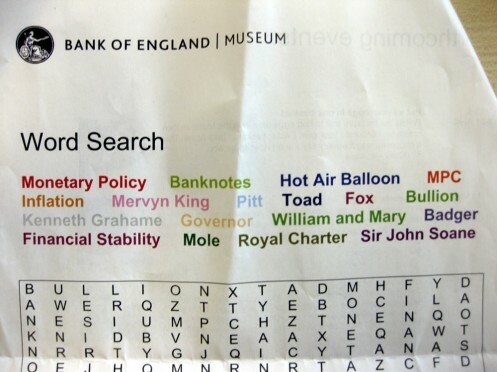 Best of all, at the Bank of England Museum you can help yourself to an entertaining Bank of England wordsearch on the way out. Badger!